The book is titled “Dandy’s Discovery” and will take readers on a journey of finding acceptance. Pictured is author and illustrator Emma Di Gesu at Pinelands Branch Library on June 16. Her journey in writing and illustrating the children’s book stemmed from a final project assignment for her creative writing class during her sophomore year. 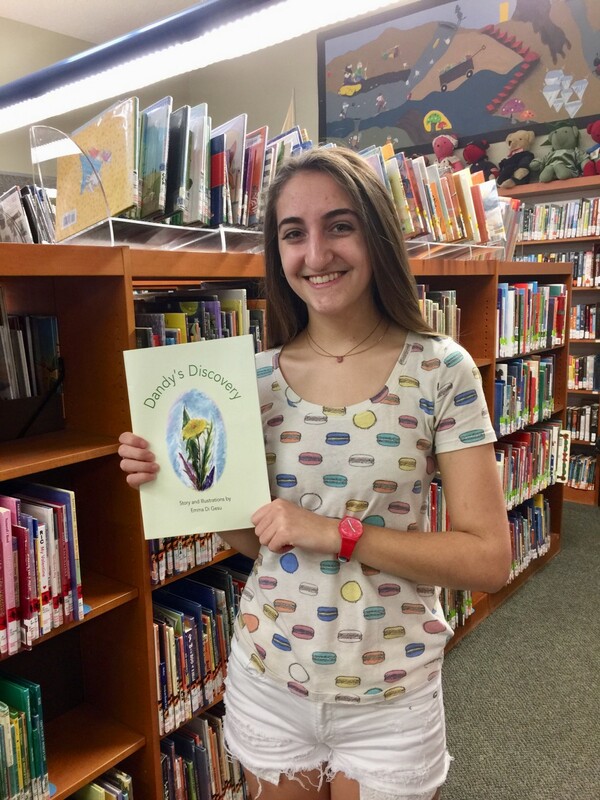 She immediately knew she wanted the book to be focused on a dandelion and was able to take the opportunity her class project presented her as a way to establish herself as a published writer. She never felt as though she fit in with the other garden flowers, and they didn’t treat her as if she were comparable to the rest. Although she spent her days dreaming of being a part of the garden, she woke up one morning with her yellow petals transformed into white seeds. Dandy had a change in heart about her self-worth, and as her seeds blew into the air she realized there is a world much larger than the garden she longed to be a part of. The process of publishing “Dandy’s Discovery” began at the 2017 Medford Art, Wine, & Music Festival. Di Gesu’s father, Gary Di Gesu, stopped by the Payton Press booth at the festival and shared the book with company owners Gloria Barone and Jim Rosanio. The two are married and have worked together to publish four books of their own, with Barone being the writer and Rosanio being the illustrator. Barone said she doesn’t typically publish books presented to her because she feels there isn’t universal appeal or because she doesn’t feel a connection with the message. After months of meeting with Barone and Rosanio to perfect the story, “Dandy’s Discovery” was published in April. Di Gesu had a face painting booth at this year’s Medford Art, Wine, & Music Festival on June 10 to promote her book and held a reading of the book on June 16 at Pinelands Branch Library. The next steps include putting “Dandy’s Discovery” on Amazon, visiting surrounding town libraries and stopping by her former elementary school in hopes of incorporating the book into lesson plans.